First of all, I want to apologize for not having updated this site since avril. This happened only because I've been really busy at work, and the few things I've done on VmwAROS didn't include updating the site, sorry. 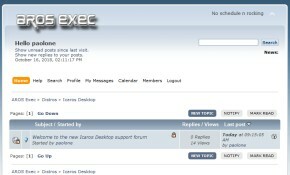 However, it's surely a good time for AROS development, and following the buzz on aros-exec you might find some clues about the new features which VmwAROS will get in its next releases. 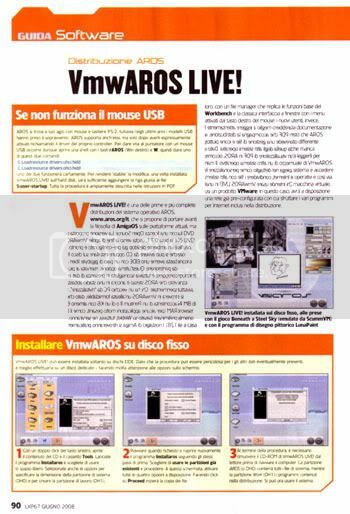 In the meanwhile, I'm really proud to give this news to all VmwAROS italian fellows: in the june issue of Linux Pro, you will find VmwAROS LIVE! 0.7.1 ISO image stored on the covermounted DVD-ROM, so you won't need to download it anymore (if you haven't already done that). The magazine explains also how to install VmwAROS on the hard drive. People interested in alternative operating systems really shouldn't miss this issue of the magazines, since it reviews also Haiku, Syllable, KolibriOS, ReactOS and Aranym, and there's obviously some space for plain AROS too!